Protesters arrested at the Regents' Meeting today. Here are some photos. Yudof urges Regents to support Brown's Tax Initiative. In an example of decisive leadership they didn't make a decision. Regents cancel Aristocrat's "Let Them Eat Cake" Pension Plan. Unclear what Edley, Olian, and the Other Aristocrats will do. At least so far they haven't asked for some of the parking revenue. Judge rules that almost the entirety of the Reynoso report on UC Davis Police Violence can be released in a few weeks. UC sits on those parts they could have released already. Oops! Looks like there is more to answer for in the Berkeley Administration emails from the November 9 crackdown on Occupy Berkeley. Even the Regents seem to understand that UCLA's Disneyland on Campus doesn't make sense. UPDATE 2 (3/31): UCLA's faculty Council on Planning and Budget endorse the Luskin Center after the Regents table it. See Dan Mitchell's explanation and critique. The CPB document he posts itemizes the funding of the $112M in costs after the Luskin gift, which are mostly bonds (pp 3-5). Private fundraising is associated with so many of public universities' most exciting projects, and absorbs so much of each institution's creative energy, that it is easy to forget that it comes with costs and negative side effects that need to be weighed into the mix. This week's meeting of the UC Board of Regents illustrates the issue. 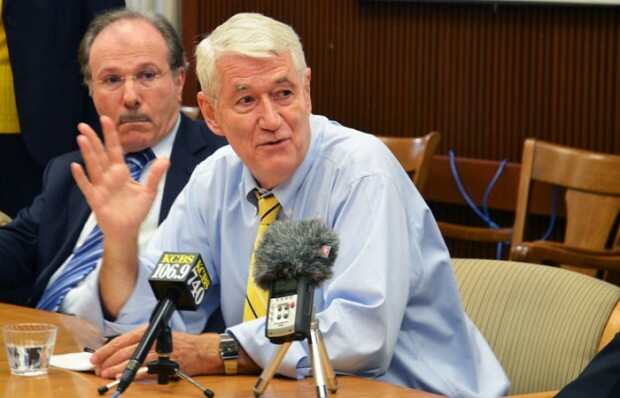 On Thursday, the Regents will review the Annual Report on University Private Support. This afternoon, the Regents are considering a funding proposal for a new conference center at UCLA that will bear the name of its major donor. The report on private support offers the kind of aggregate figures that have convinced a lot of people that fundraising is a workable answer to public funding cuts. The takeaway is, This past fiscal year, the University of California received almost $1.6 billion in private support." Since this is about twice the current year cut in state support, and since UC's core funds are about $5.2 billion (Display 1), it looks as though this great intake could make a major dent in UC's budget problems. The report claims that "every gift is helping UC continue its mission of research, teaching, and public service." If UC is to continue to be a system of research universities, it is essential to maintain robust graduate programs. Sadly, the Regents and UCOP are making choices that undermine Ph.D. education, often with little financial benefit to UC. One particularly detrimental factor is the practice of raising graduate tuition in tandem with undergraduate tuition. Very few Ph.D. students pay tuition out of their own resources. Some have their tuition paid out of departmental block grants, and more have their tuition remitted because they work as teaching assistants. 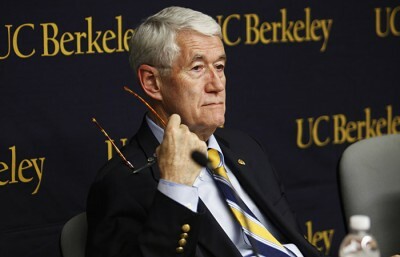 In these cases, increased graduate tuition simply means UC is picking its own pocket. All is not equal, though, because the total number of students who can be supported by institutional funding necessarily declines as per student costs rise. Reclaim UC offers more on the remarkable "stay away" orders to students. Objections to the orders are growing. The Robinson/Edley committee will be reporting their thoughts on UC Policing at next week's Regents' meeting. The belated return of wintry rain and cool temperatures to the Bay Area has been joined since last week by a deeper chill, one threatening free speech and assembly across not only the UC Berkeley campus but, indeed, the entire UC system. Here’s a recap. • Since Friday March 16 four members of the campus community arrested during the UCPD’s brutal break up of the Occupy Cal encampment on November 9, 2011—as well as nine individuals not arrested but later identified by the UCPD and DA from video of the event as being present that day and being leaders of protest—have been arraigned at Wiley W. Manuel Courthouse, Oakland on charges brought by District Attorney Nancy O’Malley (allegedly resisting arrest or obstructing an officer, obstructing a thoroughfare, and in two cases battering an officer—charges, I’ve read, which could result in fines of $1000 or one year in jail). That announcement earned a flood of email commentary among activist faculty on this campus: wondering why it had happened, who the next Chancellor might be, how we might find some leverage to influence that outcome? Is this an opportunity for something more creative? What is the most salient new force in American political consciousness? Occupy. Occupy the process by which the next Chancellor will be chosen. Jerry negotiates with Teachers about a compromise tax initiative. You can find more here. Cambridge University suspends student for 2 1/2 years for reading a poem in protest of David Willetts' visit. The arbitrariness of the charge didn't go unnoticed. Students in UK continue their protests. Police Officers privacy vs. the public's right to know at stake in Reynoso report's release. Santa Monica College is going to start offering two-tiers of courses. So much for CA's history of educational opportunity. Two professors charge that Arizona State violated their intellectual property in using their course materials online without their permission. In the world of rankings it doesn't look like Birgeneau and Breslauer are flying with the Cardinals. More on the state of economics. Goldman Sachs executive resigns because of change in corporate culture. Darth Vader follows his example. Birgeneau announces he is stepping down in December. Berkeley Faculty Association calls on Birgeneau to condemn Alameda DA's decision to charge November 9th protesters. It turns out that the UCB Tang Center shared information with UCPD on those protesters who suffered injuries on November 9th. California Scholars for Academic Freedom protest President Yudof's recent statement linking protest to hate speech. Davis Faculty Association points to some problems in UCD's recent policies on protest. 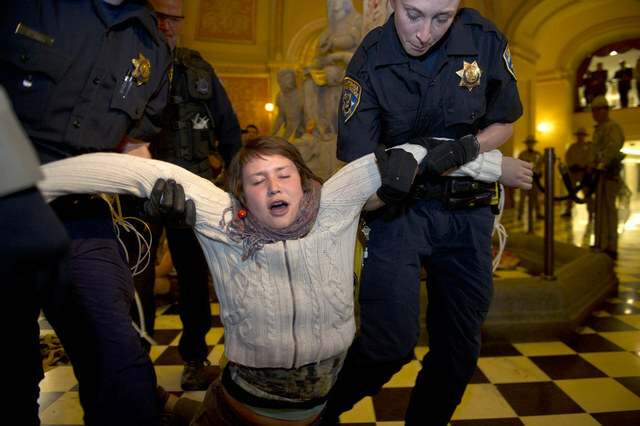 Occupy challenges administrators in new ways. Stafford Loan interest rates are about to double. Increased scrutiny of big for-profit colleges is causing a decline in enrollment. Colorado considers law that would make it easier to offer lecturers and adjuncts multi-year, enforceable contracts. UPDATE: Linda Lye of the ACLU analyzes the implications of the prosecution of the November 19th Protesters. And the ACLU has issued a new PRA request to see what role the University may have played in the decision to prosecute. On March 1, Alameda County District Attorney Nancy E. O'Malley sent criminal complaint and summons to eight (update: nine) participants in the protests on UC Berkeley's campus on November 9th. 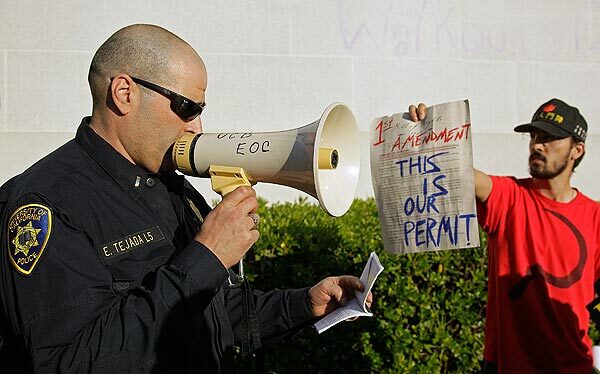 For at least one of the eight, English Professor Celeste Langan, the charges were filed under California Penal Code Sections 148, covering Resisting, Delaying, or Obstructing a Police Officer. Another of the indicted, Zachary Habash, is also accused of battery of a police officer. Reclaim UC has more information. Those who have read a lot of LA noir, have read Langan's account, and have seen video of the incident, including this clip of a police attack on the line of demonstrators, will appreciate the irony of the DA indicting Langan for being arrested by her hair. Those yet unappreciative can also read two analyses of the November 9 protests and the police response: one by Langan, and a second by Profs Judith Butler and Jonathan Simon. Graduate student Shane Boyle, who sustained a broken rib during the incident, has also been summoned. This blog has posted a petition calling on UC Berkeley Chancellor Robert Birgeneau to follow UC Davis Chancellor Linda Katehi in asking his county's DA to withdraw these charges. The Berkeley Faculty Association has a petition for signing by members of the UC Berkeley community. There is a picket planned for Monday at noon at California Hall on the Berkeley campus. Today was the day of thousands marching: You can find stories here, here, and here. CHP officers have begun arresting protesters occupying the Capitol. Here are some images from today's protests. And here is some video of the Occupation. Jerry Brown tries to turn the protests to his advantage. Doesn't recognize how responsible he is. 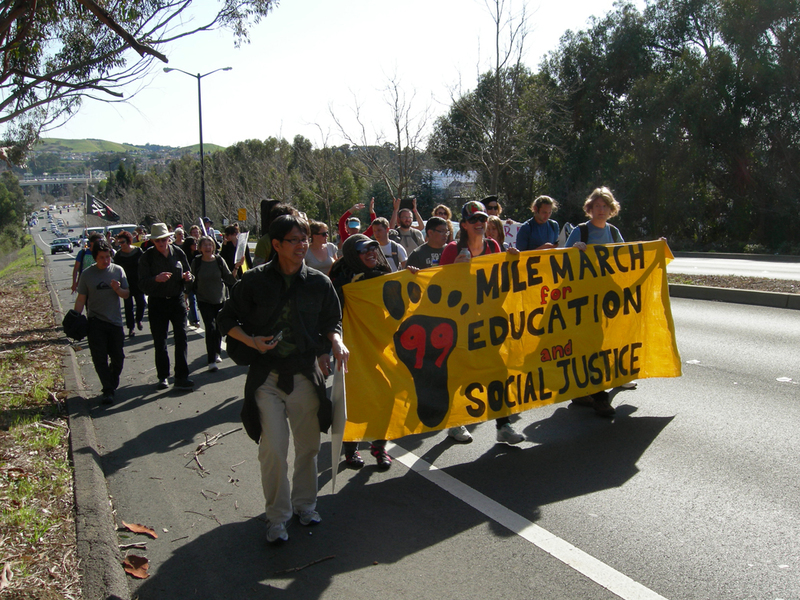 A number of defenders of public higher ed are talking the long way to Sacramento for the March 5th demonstrations. A participant writes, "More than a dozen UC Berkeley faculty met up with the marchers in Pinole at about 1 pm, where they stopped for lunch, and then joined the march to Hercules and a few on to Rodeo, then returning to Berkeley. Several of us wore regalia. The "Tax the Rich" pencil is also going all the way to Sacramento." Students and Faculty were out throughout the state protesting the attack on public higher ed. Students Occupied at UCSC and UCSD. 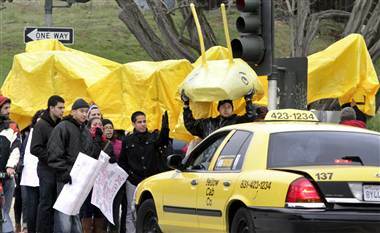 At Santa Cruz entrances were closed and some classes cancelled in response to protests. Not that that stopped a car from trying to drive through the crowd. Here is some info on southern California. Of course, the protest wasn't limited to California. Here is the Occupy Colleges live stream of yesterday's events. Angus Johnston has much more on the protests across the nation.